It started in 1988! List of the members in 1988(PDF). A brief history of Sino-Eco (PDF). The idea of having a SINO-ecological organization can be traced back to as early as 1986 at the joint meeting of ESA and the International Congress of Ecology (INTECOL) at Syracuse. 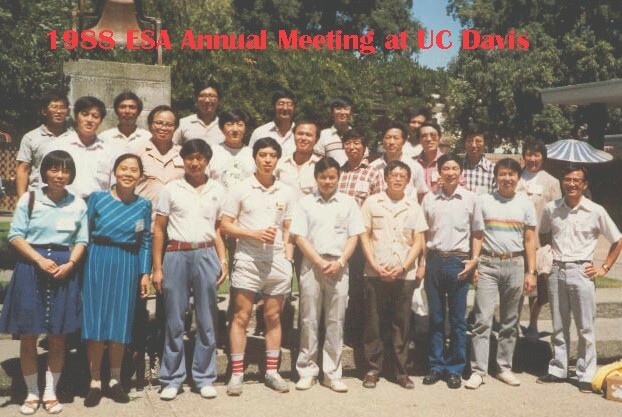 During the 1988 annual meeting of the Ecological Society of America, at the University of California, Davis, over 20 overseas students conceived the idea of forming an overseas Chinese ecological organization (Photo above, Davis 1988). After the meeting, Jianguo Wu, Xinyuan Wu, and Yegang Wu (the “Triple Wu”) worked diligently and passionately to establish the organization, and came up with the name, SINO-ECOLOGISTS CLUB OVERSEAS (SINO-ECO for short) ( China Daily 1989). The association members elected the first president in November 1989. In January 1990, the association passed its bylaws, and soon after that the Association was officially registered as a non-profit organization. Currently, SINO-ECO is a non-profit academic organization registered in the State of Massachusetts, USA. The following is the list of SINO-ECO presidents in chronological order: Drs. Jianguo Liu, Xingguo Han, Pu Mou, Jiquan Chen, Xi He, Quan Dong, Ye Qi, Guanghui Lin, Junda Lin, Yude Pan, Shi li Miao, Changhui Peng, Binghe Gu, Ge Sun, Jianwu Tang, Xiaohua Wei and Yushun Chen. Most of the association members hold advanced degrees and are working in universities, research institutes, and government agencies in North America. There are also some members on other continents. Many SINO-ECO members are now major players in their research fields, including, but not limited to, global change ecology, landscape ecology, ecosystem restoration, remote sensing, aquatic ecology, wetland ecology, conservation biology, and biological invasion . SINO-ECO members are making significant contributions to advances in ecology and using ecological principals and theories to solve real world problems.